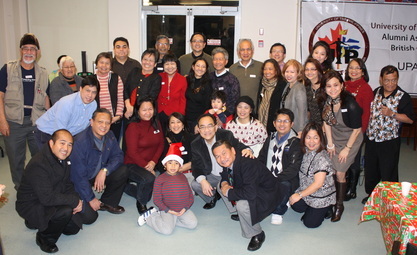 A group of Canadian-Filipinos have banded together to form an ad hoc committee called Canadian Filipinos for Richmond Cares Richmond Gives (RCRG: https://www.rcrg.org/). I am involved in this committee as I am member of RCRG’s Board of Directors. The group is staging a community concert on 4 March 2017 at the Fraserview Church in Richmond. Please see attached the ticket and poster for the event. Please also see attached a letter from RCRG Board Chair, Pat Watson, providing background and impetus for the event and request for your support. This endeavour is quite unique as this is borne out of grassroots initiatives from talented community members to perform for free to fundraise for the Seniors Community Support Services programs of RCRG. Community Members from Vancouver, Richmond, and Surrey are invested in this community effort. Mayor Malcolm Brodie of the City of Richmond and Member of the Legislative Assembly, Mable Elmore of Vancouver-Kensington, are gracing the event to show support. MLA Elmore will even be singing with one of the bands. There will also be an art exhibit by the Dimasalang III International Artist Group at the lobby of the concert event. Through this community effort, the Filipinos will put their vocal chops and artistic inclination for a worthwhile cause. We hope that UPAABC can support our efforts buying tickets in bulk and watching the show and spreading the word about it. If you require any assistance in writing or gathering information about the event, I would be more than happy to assist. As we close out 2011, please take a moment to reflect on all that we have accomplished this year, which has been considerable. None of this can be done in isolation and it is very gratifying to see how each one (in their own ways) rallied around the activities and just "got it done"! Your Board has recently been through a planning session to map out more activities for next year. While it may look daunting, we take comfort in the fact that we have a good number of “Iskolars ng Bayan” in our active roster who are prepared to step up and help make a difference in other people’s lives – from socializing at our events and enjoying each other’s company to assisting in organizing and leading events that impact our society. But, before we look too far ahead, please pat yourself on the back for a great and productive 2011. We truly appreciate your participation and support in all our initiatives! On behalf of your Board of Directors, I hope this holiday season will give many of you the opportunity to rest, recharge and enjoy the company of family and friends. I wish you and your loved ones all the best for the holiday season. Looking forward to more success in 2012! 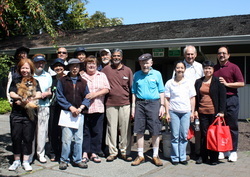 Congratulations to our guest golfers who won the major prizes at the Fun Golf Tournament on June 6, 2011 at the Queen Elizabeth pitch-and-putt course. Alfredo Moreno scored 2 over par to beat our very own Nezz Navasero by 2 strokes in the men's division. A new UPAABC leadership and board of directors were elected in a special meeting held over the Easter weekend following the resignation of a few officers due to personal reasons and other commitments. Eric Iñigo has moved up from Vice President to President, Memberships Director Ma. Gliceria (Gigi) Cagampan is now Vice President/Membership; and Vic Ting, Joseph Solis and Ruby Cortes have joined the board. Conrado Malilay remains Board Secretary. The complete lineup is as follows: Eric Iñigo, President; Gigi Cagampan, Vice President; Nonoy Malilay, Secretary; Victor (Vic) Ting, Treasurer; Ruby Cortes, Assistant Treasurer; and Fe Alluri, Nemesio (Jun) Esquejo, Vic Ingco, Nestor Navasero, Sony Obregon and Joseph Solis, Directors. “As a long-time member and officer of UPAABC, I’m honoured to be your Vice President. It’s very encouraging to work with Eric, the board and our members, and together, we will do our very best to achieve our objectives this year and the next,” Gigi said. 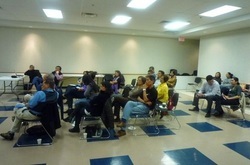 The brand-new UPAABC website was a highlight of the monthly socials held April 9 at the Metrotown mall in Burnaby. Speaking before the assembled members, Vice President Eric Íñigo explained the development process of the site and presented its key features, which include a section on UPAABC’s origins and history; blogs; members’ articles; a marketplace for classified ads and job leads; and a growing selection of photo albums capturing the organization’s events and projects over the years. The website was warmly received with members and officers commenting on the ease of use and variety of content available. According to Eric, new features will be rolled out soon, and Lou Corpuz from the web team is also working on building more content for the site in collaboration with the many talented members of UPAABC. Bookmark the website today at www.upaabc.org! 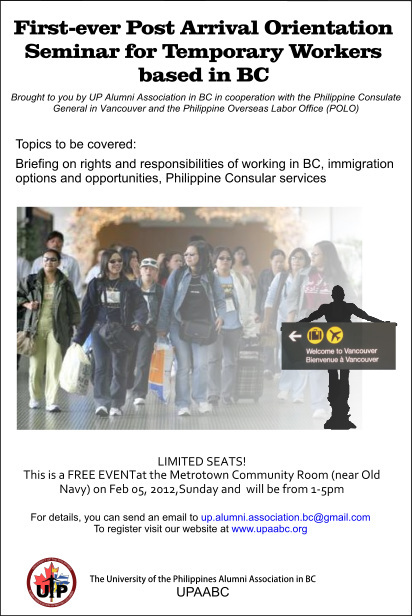 The UPAABC Online - the official website of the University of the Philippines Alumni Association in British Columbia! In February 2011, your Board of Directors sounded a call for volunteers to develop the first full-fledged public website for UPAABC. After a few email exchanges, the working group was formed, consisting of Joseph Solis, Lou Corpuz-Bosshart and Eric Inigo. While the initial plan was to work with an external consultant, we realised that we could build and launch the site ourselves, and so this site became reality. But this is just the first step. With UPAABC Online now live, the next step is for all of us to make it a true community for UPAABC members. Get to know the site and send us your thoughts, articles, photos, videos, artwork and columns! Suggest news and features. Author a new blog, comment on someone else's blog, or post a classified ad. Tell the community about a promotion or a new venture. Simply email your contributions and suggestions to up.alumni.association.bc@gmail.com and let's work together to make it happen. With tax filing deadlines approaching, the UPAABC board has taken the initiative to brief the membership on the latest tax policies and tips for effective tax planning.